The glittering tapestry of young stars flaring to life in this new NASA/ESA Hubble Space Telescope image aptly resembles an exploding shell in a fireworks display. 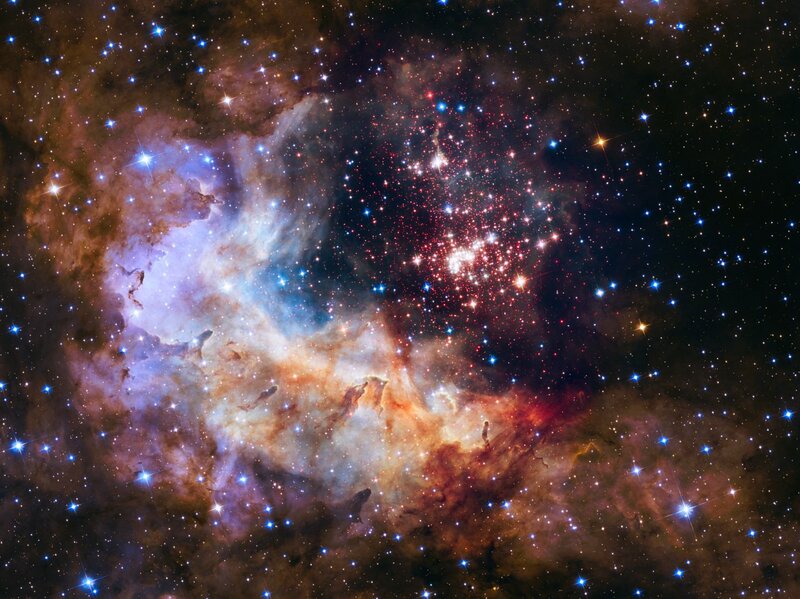 This vibrant image of the star cluster Westerlund 2 has been released to celebrate Hubble’s 25th year in orbit and a quarter of a century of new discoveries, stunning images and outstanding science. On 24 April 1990 the NASA/ESA Hubble Space Telescope was sent into orbit aboard the space shuttle Discovery as the first space telescope of its kind. It offered a new view of the Universe and has, for 25 years, reached and surpassed all expectations, beaming back data and images that have changed scientists’ understanding of the Universe and the public’s perception of it. 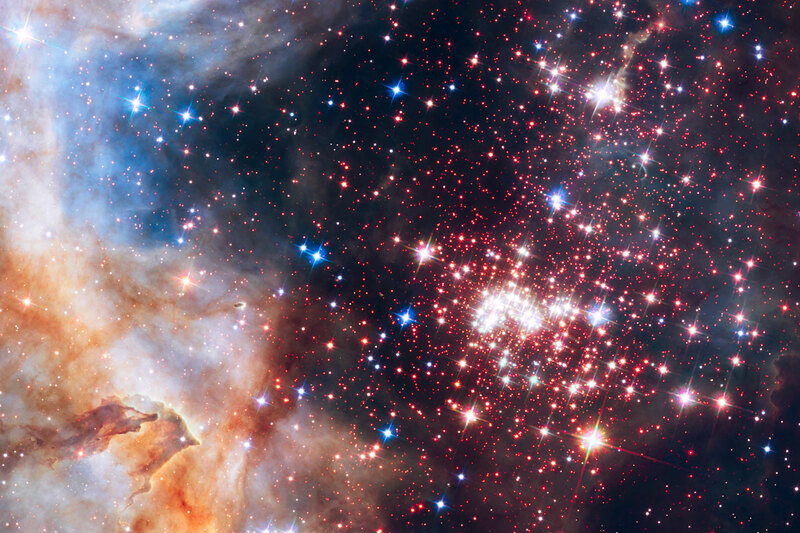 In this image, the sparkling centrepiece of Hubble’s silver anniversary fireworks is a giant cluster of about 3000 stars called Westerlund 2 . The cluster resides in a raucous stellar breeding ground known as Gum 29, located 20 000 light-years away in the constellation Carina. 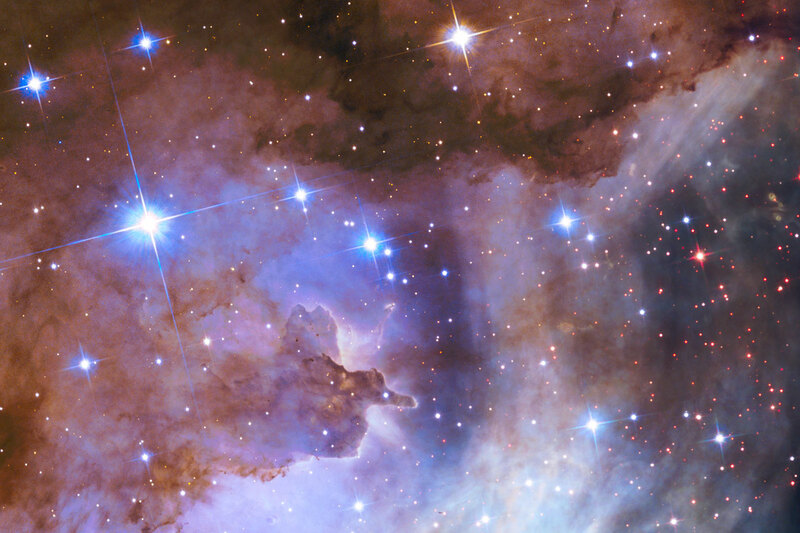 The stellar nursery is difficult to observe because it is surrounded by dust, but Hubble’s Wide Field Camera 3 peered through the dusty veil in near-infrared light, giving astronomers a clear view of the cluster. Hubble’s sharp vision resolves the dense concentration of stars in the central cluster, which measures only about 10 light-years across. 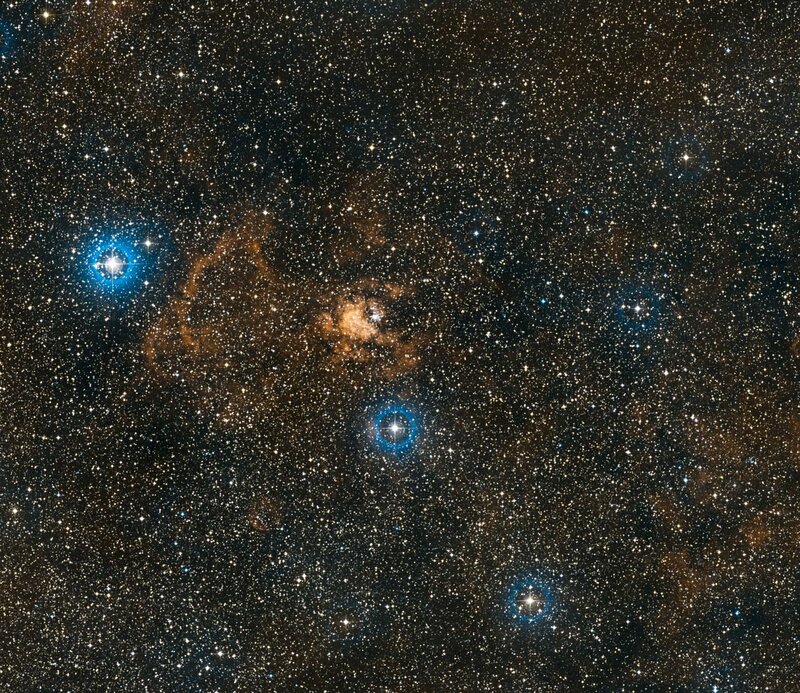 The giant star cluster is only about two million years old, but contains some of the brightest, hottest and most massive stars ever discovered. Some of the heftiest stars are carving deep cavities in the surrounding material by unleashing torrents of ultraviolet light and high speed streams of charged particles, known as stellar winds. These are etching away the enveloping hydrogen gas cloud in which the stars were born and are responsible for the weird and wonderful shapes of the clouds of gas and dust in the image. The pillars in the image are composed of dense gas and dust, and are resisting erosion from the fierce radiation and powerful winds. These gaseous monoliths are a few light-years tall and point to the central cluster. 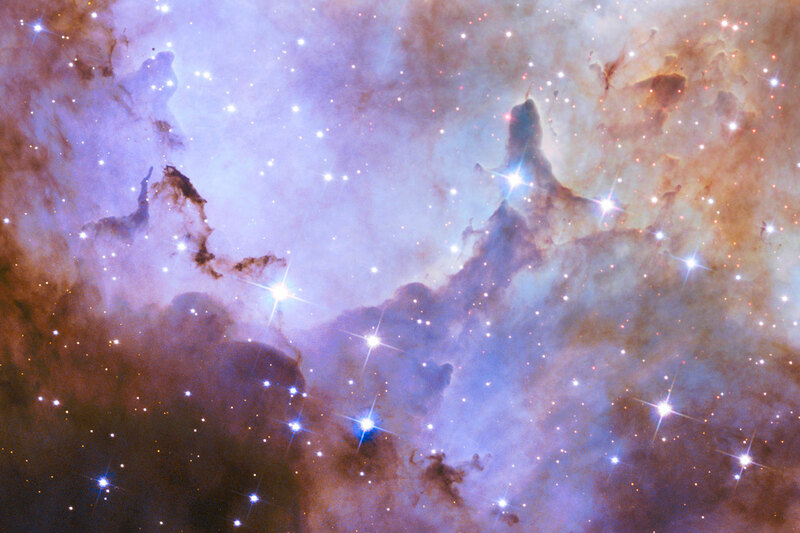 Other dense regions surround the pillars, including dark filaments of dust and gas. Besides sculpting the gaseous terrain, the brilliant stars can also help create a succeeding generation of offspring. When the stellar winds hit dense walls of gas, they create shocks, which generate a new wave of star birth along the wall of the cavity. The red dots scattered throughout the landscape are a rich population of forming stars that are still wrapped in their gas and dust cocoons. These stellar foetuses have not yet ignited the hydrogen in their cores to light-up as stars. 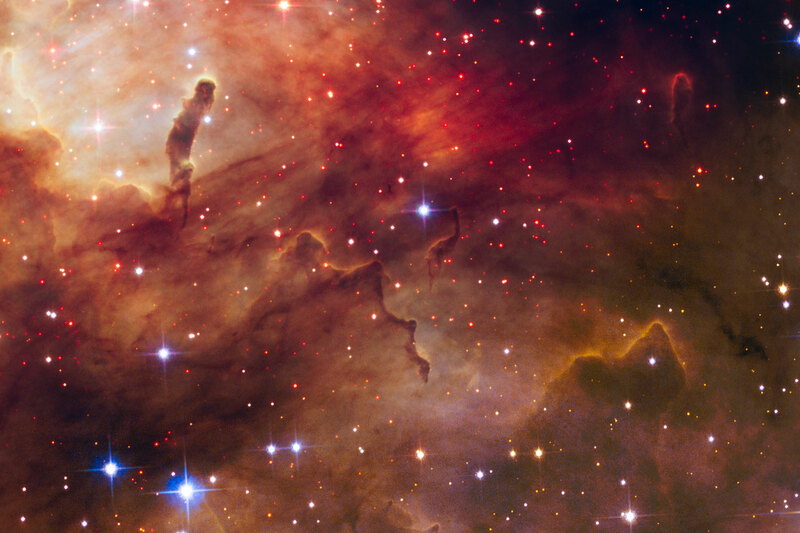 However, Hubble’s near-infrared vision allows astronomers to identify these fledglings. 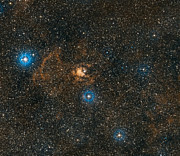 The brilliant blue stars seen throughout the image are mostly in the foreground. This image is a testament to Hubble’s observational power and demonstrates that, even with 25 years of operations under its belt, Hubble’s story is by no means over. Hubble has set the stage for its companion the James Webb Space Telescope — scheduled for launch in 2018 — but will not be immediately replaced by this new feat of engineering, instead working alongside it. Now, 25 years after launch, is the time to celebrate Hubble’s future potential as well as its remarkable history. A new anniversary image is released every year; last year Hubble snapped the ethereal Monkey Head Nebula (heic1406). The year 2013 saw the release of a strikingly delicate view of the Horsehead Nebula (heic1307), and Hubble’s 22nd year was marked by a huge mosaic of a celestial spider (heic1206)! Other images include a multicoloured view of Saturn (opo9818a), a Tolkien-esque shot of the Carina Nebula (heic1007a), and a beautiful cosmic rose made up of merging galaxies (heic1107a). More anniversary images can be seen here. Westerlund 2 is named after Swedish astronomer Bengt Westerlund, who discovered the grouping in the 1960s. The original observations of Westerlund 2 were obtained by the science team: Antonella Nota (ESA/STScI), Elena Sabbi (STScI), Eva Grebel and Peter Zeidler (Astronomisches Rechen-Institut Heidelberg), Monica Tosi (INAF, Osservatorio Astronomico di Bologna), Alceste Bonanos (National Observatory of Athens, Astronomical Institute), Carol Christian (STScI/AURA) and Selma de Mink (University of Amsterdam). Follow-up observations were made by the Hubble Heritage team: Zoltan Levay (STScI), Max Mutchler, Jennifer Mack, Lisa Frattare, Shelly Meyett, Mario Livio, Carol Christian (STScI/AURA), and Keith Noll (NASA/GSFC). For more information on the anniversary activities you can visit the website.